Esquius, K. S. & Escalante, A. H. Periphyton assemblages and their relationships with environmental variables in a eutrophic shallow lake from Pampa Plain, Argentina. Pan-American Journal of Aquatic Sciences, 7(2): 57-72. Download PDF file (684 Kb). Ragonese, S. & Morara, U. Evidence of short-term discard mortality of trawled Sphoeroides pachygaster (Osteichthyes, Tetraodontidae) off the southern coast of Sicily (Central Mediterranean Sea). Pan-American Journal of Aquatic Sciences, 7(2): 73-76. Download PDF file (282 Kb). Bertassoni, A., Xavier-Filho, N. L., Rabelo, F. A., Leal, S. P. S., Porf�rio, G. E. O., Moreira, V. F. & Rabelo, A. P. C. Paraguay River Environmental Monitoring by Rede de Prote��o e Conserva��o da Serra do Amolar, Pantanal, Brazil. Pan-American Journal of Aquatic Sciences, 7(2): 77-84. Download PDF file (401 Kb). Dalu, T., Clegg, B., Marufu, L. & Nhawatiwa, T. The feeding habits of an introduced piscivore, Hydrocynus vittatus (Castelnau 1861) in a small tropical African reservoir. Pan-American Journal of Aquatic Sciences, 7(2): 85-92. Download PDF file (564 Kb). Vignatti, A., Cabrera, G. & Echaniz, S. Changes in the zooplankton and limnological variables of a temporary hypo-mesosaline wetland of the central region of Argentina during its drying. 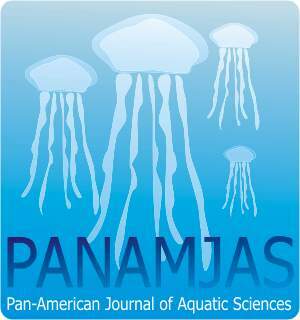 Pan-American Journal of Aquatic Sciences, 7(2): 93-106. Download PDF file (927 Kb). Andrades, R., Bolzan, M. S., Contaifer, L. S., Gomes, M. P., Albuquerque, C. Q., Gaelzer, L. R. & Martins, A. S. Evidence of sandy beaches as growth grounds for commercial fish in the south-western Atlantic. Pan-American Journal of Aquatic Sciences, 7(2): 107-110. Download PDF file (256 Kb). Ximenez, S. S., Gon�alvez, T. P., Oliveira, M. C. L. & Tozetti, A. M. Substrate color selection by tadpoles of Physalaemus gracilis (Boulenger, 1883) (Anura, Leiuperidae). Pan-American Journal of Aquatic Sciences, 7(2): 111-116. Download PDF file (348 Kb).